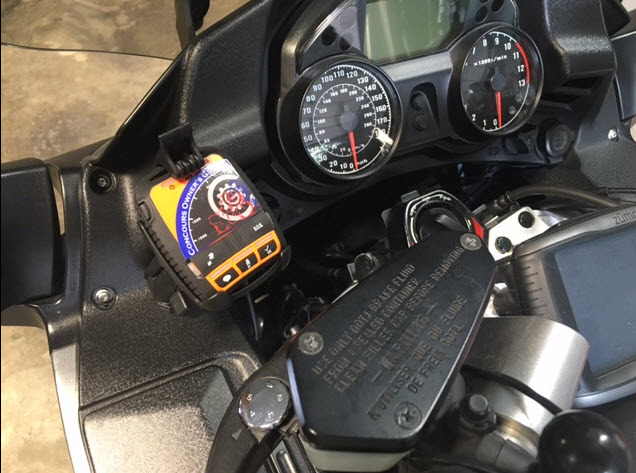 I ran all year with the Spot Gen 3 GPS Tracker attached to a handlebar mount on the clutch side. It was way too high and difficult to see the LED's, so I moved it down to the left side by mounting a RAM Ball in front of the glove box. It was also too Orange for my liking, so I trimmed up the Johnson Tennessee Rally sticker and added some COG bling. Here is the link to the RAM ball. Inquiring minds need to know more. Can you provide a better pic of the mount. Also, where did you get the Spot holder. Right now, I just have mine in my map holder of my tank bag. Ram makes a mount specifically for the Spot Gen 3. I liked the Ram ball in the link above better than the one that came with the mount. I also used a shorter double socket arm in the second link. They also sell longer ones. I'll try to post a better pict tomorrow. Here is another photo showing the double socket arm and the Ram holder. You don't need to see or monitor spot. Just turn it on and forget it. 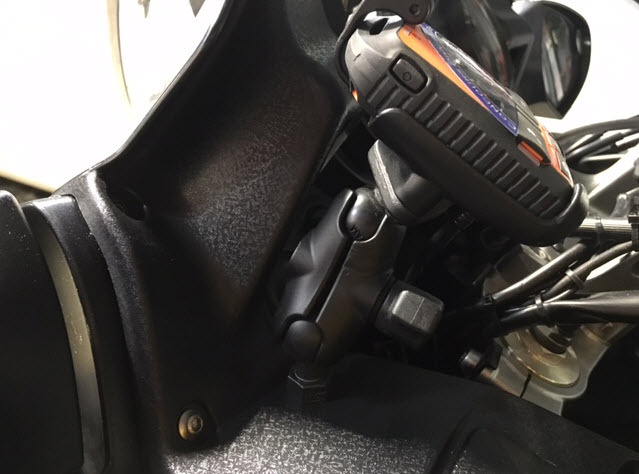 For that your tank bag works just fine. That depends on how you use it. I ride long distances, often alone. I use the "OK" and pre-programmed "Message" features often. So I want to have my Spot in a place to press the buttons, turn the tracking on and off, and monitor whether or not the messages are sent. I started out with it in my pocket, which is arguably the best location if you separate from the bike in a crash. But think about it, how many times will you pack or pocket your Spot away and forget to turn on the Tracking? If you do forget to turn it on, it's important to see that it not working. In the pocket also relies on batteries as opposed to USB power. A tradeoff. I have tracking on all the time and just send messages when I stop somewhere. The lithium batteries will usually last for at least a week. I use a jogger cell phone pocket that is neoprene and has a strap that I put on my forearm. 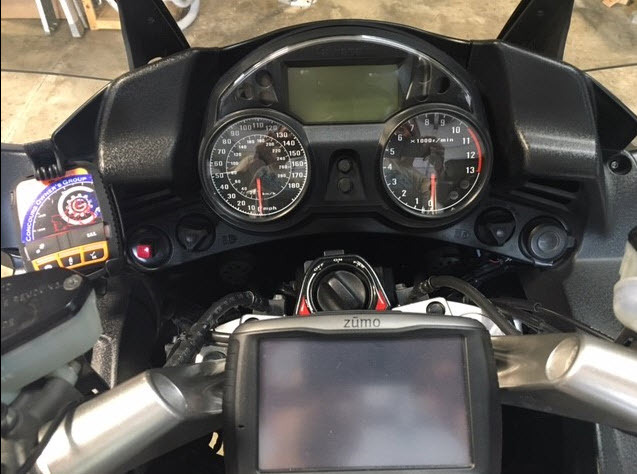 I can see the display through the plastic cover just fine and its with me if I separate from the bike. My friend crashed his Honda Blackbird and his bike went into a ditch, flipped over an embankment 40 feet away and he lay in the ditch with injuries so he was not able to crawl out. If the SPOT was on his bike then he would have been SOL. Had 2 riders with him at the time but was out of cell coverage, the story ended fine after a week or so in the ICU. I use this and have carabineer and strap that comes with the SPOT also attached to my jacket. I also keep mine accessible if I part ways with the bike. It is connected to the a piece of webbing sewn into the pocket flap on my RoadCrafter. If necessary, it is reachable with either hand. Good ideas on the last two posts. I won't argue that this is by far the best way to use the Spot if you get separated from the bike. I suppose I look at the tracking first, none emergency assistance second, and dire need third. Should that order be reversed? Probably. I have a Verizon phone and often use it for streaming Pandora or Amazon music. It's pretty obvious when you ride though areas with no cell phone coverage. I'm glad I have the Spot for communication and continuity of tracking. If I'm riding in a remote area with few drivers, I may put the Spot in the pocket for the reasons mentioned.